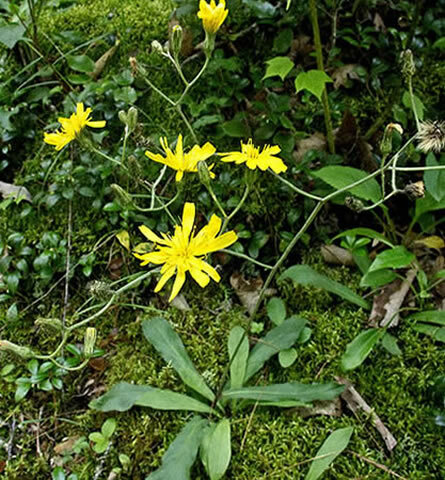 This perennial herbaceous plant is 1-3' tall, consisting of a rosette of leaves from which a flowering stalk develops. 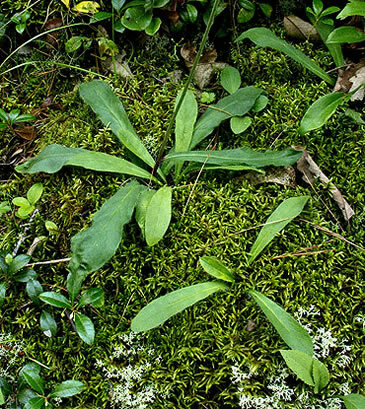 The basal leaves are up to 6" long and 2" across, tapering to a narrow petiole. They are ovate or oblanceolate, usually with smooth margins, and have scattered white hairs that are ½" or less. The upper half of the stalk is either leafless, or has a few tiny leaves that resemble bracts. Generally, the lower stalk is conspicuously hairy (particularly near the bases of the leaves), while the upper stalk has few or no hairs, except where the flowers occur. This stalk terminates in a panicle of composite flowers. Each composite flower is about ½–¾" across, consisting of a head with 15-30 yellow ray florets. The ray florets have tips that are truncated, ending in 5 small teeth. The blooming period is mid-summer to early fall, and lasts about 1-2 months.